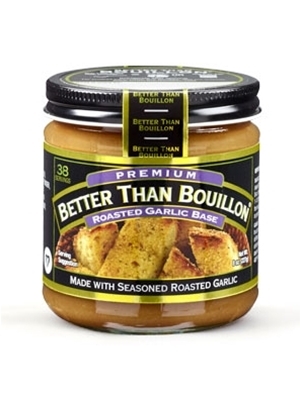 Better Than Bouillon Roasted Garlic Base is made with real Roasted Garlic and natural juices. It gives your favorite recipe a deliciously savory flavor. Use basic stock for soups, sauces and gravies, or to cook vegetables, rice or pasta with more flavor. Also check out the Garlic Bread suggestion below! Each jar contains 38 one cup servings. Dissolve 1 teaspoon (equal to one bouillon cube) beef base in 8oz boiling water. For each quart of stock needed, use 1 1/2 tablespoons Roasted Garlic Base. In a bowl, mix 1 cup of softened butter with 3/4 teaspoon of Roasted Garlic Base, 1 teaspoon Italian herbs and 1/2 cup of shredded Parmesan cheese. Spread mixture over desired bread and bake on a sheet pan in a preheated 400 degree oven for 8-10 minutes or until lightly browned.